A new paper published in Nature Climate Change reconstructs temperatures in Antarctica and South America over the past 1000 years and shows that most of Antarctica has cooled over the past 1000 years. The temperature reconstructions in figure 1a below show South America was about as warm during the Medieval Warm Period 800-1000 years ago, and shows that Antarctica as a whole has cooled ~0.4C over the past 1000 years. 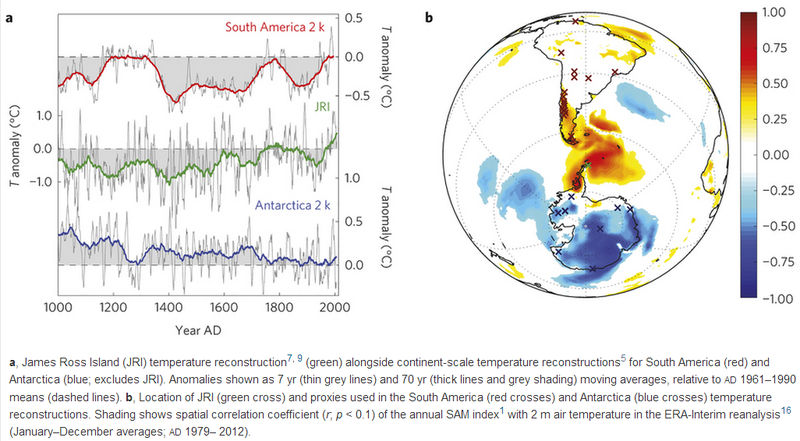 Temperature reconstructions for South America on top, James Ross Island [JMI] on the Antarctic Peninsula in middle, and Antarctica as a whole on bottom graph. Blue colors indicate cooling, white no change, red warming in legend for fig 1b. Climate models, however, predicted anthropogenic global warming to cause the most pronounced warming at both poles, a significant decrease in Antarctic sea ice, and more warming and sea ice loss in Antarctica than the Arctic, all of which are failed predictions. Instead, Antarctic sea ice levels is currently well above the highest recorded levels in history for time of year. The Southern Annular Mode (SAM) is the primary pattern of climate variability in the Southern Hemisphere1, 2, influencing latitudinal rainfall distribution and temperatures from the subtropics to Antarctica. The positive summer trend in the SAM over recent decades is widely attributed to stratospheric ozone depletion2; however, the brevity of observational records from Antarctica1—one of the core zones that defines SAM variability—limits our understanding of long-term SAM behaviour. Here we reconstruct annual mean changes in the SAM since AD 1000 using, for the first time, proxy records that encompass the full mid-latitude to polar domain across the Drake Passage sector. We find that the SAM has undergone a progressive shift towards its positive phase since the fifteenth century, causing cooling of the main Antarctic continent at the same time that the Antarctic Peninsula has warmed. The positive trend in the SAM since ~AD 1940 is reproduced by multimodel climate simulations forced with rising greenhouse gas levels and later ozone depletion, and the long-term average SAM index is now at its highest level for at least the past 1,000 years. Reconstructed SAM trends before the twentieth century are more prominent than those in radiative-forcing climate experiments and may be associated with a teleconnected response to tropical Pacific climate. Our findings imply that predictions of further greenhouse-driven increases in the SAM over the coming century3 also need to account for the possibility of opposing effects from tropical Pacific climate changes. Warming of the polar regions has global implications for sea-level rise and climate change feedback processes such as decreased planetary albedo and the release of naturally stored carbon reservoirs. High-latitude amplification of global warming trends is clearly observed across the Arctic4, 5. In contrast, Antarctica is the only continental region where long-term cooling over the past 2,000 years has not yet been reversed to climate warming5. Yet some regions of Antarctica have warmed significantly over the past ~50 years, with the Antarctic Peninsula and parts of west Antarctica displaying the most rapid temperature increases in the Southern Hemisphere6, 7. Understanding these regional responses of Antarctic temperature to recent climate change requires an improved characterization of natural and anthropogenically driven changes in Southern Hemisphere climate variability. Here we use the James Ross Island (JRI) ice core from the northern Antarctic Peninsula7, 8, 9 (64.2° S, 57.7° W; Fig. 1), along with other published temperature-sensitive proxies5, to reconstruct Southern Annular Mode (SAM) variability since AD 1000. The SAM can be defined as the zonal mean atmospheric pressure difference between the mid-latitudes (~40° S) and Antarctica (~65° S; ref 1). The positive phase of the SAM is associated with low pressure anomalies over Antarctica and high pressure anomalies over the mid-latitudes, and this enhanced atmospheric pressure gradient results in strengthening and poleward contraction of the Southern Hemisphere westerly jet stream1. The mountainous geographic barrier of the Antarctic Peninsula makes temperature variability in this region particularly sensitive to the strength of the westerly winds passing through Drake Passage. As such, JRI is a key location for documenting SAM-related climate variability (Fig. 1b) and previous work8, 9 has demonstrated that the water-isotope-derived temperature record from the JRI ice core is significantly correlated with observational indices of the SAM1, 10. Figure 1: Regional temperature histories. a, James Ross Island (JRI) temperature reconstruction7, 9 (green) alongside continent-scale temperature reconstructions5 for South America (red) and Antarctica (blue; excludes JRI). Anomalies shown as 7 yr (thin grey lines) and 70 yr (thick lines and grey shading) moving averages, relative to AD1961–1990 means (dashed lines). b, Location of JRI (green cross) and proxies used in the South America (red crosses) and Antarctica (blue crosses) temperature reconstructions. Shading shows spatial correlation coefficient (r; p < 0.1) of the annual SAM index1 with 2 m air temperature in the ERA-Interim reanalysis16 (January–December averages; AD 1979– 2012). The JRI temperature record since AD 1000 has an inverse correlation with the Past Global Changes 2k network (PAGES2k) reconstruction of continental Antarctic temperature5 (Fig. 1a). This opposing temperature history between the Antarctic Peninsula and the main Antarctic continent is consistent with the spatial response of surface air temperatures to SAM variability (Fig. 1b) and is statistically significant on annual to multidecadal timescales (Table 1). The JRI temperature record also shows similarities to the PAGES2k South American temperature reconstruction5 that may indicate a shared climate forcing, although the positive correlation between the two data sets is not statistically significant (Table 1). However, in their long-term evolution, the South American and JRI reconstructions both indicate that the coolest 50-year interval of the past millennium occurred at AD1410–1460, with progressive phases of warming since that time (Fig. 1a). But what about the stable artic ice mass that's not really subject to seasonal change. Is that decreasing or increasing? Arctic ice mass is subject to seasonal change. Which start date would you prefer me to cherry pick?